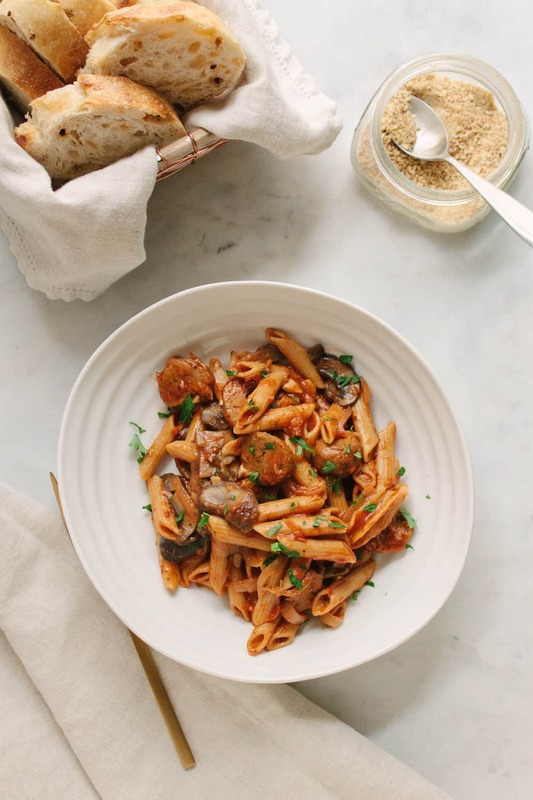 Happy Monday, I’m back with a super easy one-pot pasta recipe featuring earthy mushrooms and vegan sweet Italian sausage. I love one pot meals, so when I came across this recipe from Budget Bytes, I knew it needed to be veganised and added to the recipe collection, as it’s a perfect fit for TSV! When life is busy, having a few quick recipes on hand is priceless. You can easily throw this one-pot meal together and have it on the table in about 35 – 40 minutes. It will make enough pasta to feed a crowd, or if making for only a few, you will have plenty of left overs for brown bag lunches or quick re-heat dinners. It tastes even better the next day! One-pot pasta meals are a true blessing and will always have a spot in the meal rotation! I used baby bella mushrooms. You can purchase them whole or pre-sliced. Many times I’ll find a good deal on mushrooms. They always seem to be on sale when I need them, hopefully you will have the same luck. The Tofurky sausage I already had on hand. Another vegan sausage I recommend is Field Roast. Both taste great and have a few different flavors to choose from. I call for a large can of crushed tomatoes but diced tomatoes would work just as well too. Especially if you prefer to have chunks of tomatoes. For the seasoning, use dried basil and oregano with the option of adding fennel seeds. If you don’t have the individual herbs on hand, try using an Italian seasoning blend. Start with sauting the onions, then add the garlic and sausage and continue to cook for 1 – 2 minutes. Add in the mushrooms, tomatoes and spices. Give a good stir. You may opt to make this cook even faster. In which case, instead of cooking the onion, sausage and garlic first, simply place all the ingredients in the pot, minus the parsley, bring to a boil and continue on with the recipe. It will cut at least 7 minutes off the cooking time. Add in the dried pasta and vegetable broth/water, and give another good stir. Bring it all to boil, and let it simmer and cook. A quick and healthy one-pot meal to serve the ones you love! In a large pot or dutch oven, heat oil over medium-high heat, add onion and saute for 4 – 5 minutes. Add garlic and sausage, cook another 1 minute, stirring occasionally. Add the mushrooms, tomatoes, basil, oregano, optional fennel, broth/water, pasta, and a good pinch of salt & twist of fresh cracked pepper. Bring mixture to a boil, give good stir, cover, reduce heat to low and let simmer at a constant gentle rolling boil for 15 minutes, stir occasionally. Remove from heat, stir in a little parsley and give a good stir. Serve with a little extra parsley over top and a light dusting of Almond Parmesan. Pair it with a slice of your favorite crusty bread. If you have Italian seasoning on hand, feel free to use 2 teaspoons in place of the spices listed above. This makes a large portion, cut the recipe in half if you prefer. 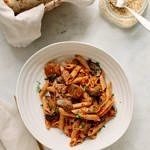 To make this recipe cook even faster, instead of cooking the onion, sausage and garlic first, simply place all the ingredients in the pot, minus the parsley, bring it all to a boil and continue on with the recipe as stated. It will cut at least 7 minutes off the cooking time.